A man who repeatedly stabbed 18-year-old Harry Potter actor Rob Knox outside a bar in south-east London has been jailed for life. Karl Bishop, 22, attacked the actor, from Swanley, Kent, after a fight outside the Metro Bar in Sidcup. Mr Knox was stabbed five times in May 2008 as he defended his brother Jamie from Bishop, the Old Bailey heard. Bishop, of Sidcup, will have to serve a minimum of 20 years before being considered for parole. Mr Knox played the part of Marcus Belby in the film Harry Potter And The Half-Blood Prince and had been promised a part in the next Harry Potter film. Bishop, who was found guilty on four counts of wounding, was given three further concurrent life sentences for wounding Mr Knox's friends. Sentencing, Mr Justice Bean told Bishop that he was a highly dangerous man. "I do not think it is proved that you intended to kill Robert Knox. The truth is that you simply could not care less whether you killed him or not," he said. "Your lack of regret let alone remorse was truly chilling". Bishop was convicted of wounding the actor's friends Dean Saunders, 23, and Andrew Dormer, 17, and wounding with intent to cause grievous bodily harm to Charlie Grimley, 17, and Nicky Jones, 20. 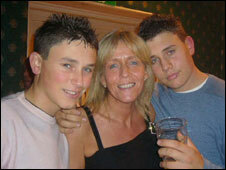 He was found not guilty of wounding another friend, Tom Hopkins, 19. He had denied murder and five counts of wounding. The court heard Bishop was acting "in revenge" as he had come off worst in a fight with Mr Knox and his friends the week before the killing. 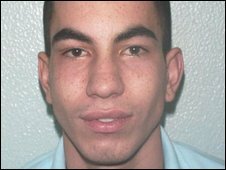 The Metropolitan Police said Karl Bishop was a suspect in an attempted robbery in March 2008 but had not been arrested. The Met added that the case was still being investigated when Mr Knox was killed. Although later there was insufficient evidence to proceed in the case two officers investigating it were given written warnings. On Wednesday, Bishop refused to return to court when Mr Knox's family read out the victim's impact statement and to hear the verdicts on wounding charges. Responding to the killer's actions the actor's father Colin Knox, 55, told ITV's GMTV programme that Bishop's "body language was disgusting". "When it comes to the crunch and he's found guilty, he disappears into a hole and he can't face the parents, the friends of Robert and those people he attacked," he said. The teenage victim's mother Sally, 51, said: "Personally, once he's got his sentence and he's gone, I will not waste my time thinking about him."